Lindsay Mason: Post weekend post! Hello folks, and welcome to any new followers or readers. Wasn't it a lovely weekend? My idea of perfect weather...sunny and warm with a cooling breeze. Hope those of you who are mums, or who have mums, had a lovely day yesterday. I was over at mum and dad's and we had a lovely trip to a little village called Scorton where we had lunch and a bit of a wander with window shopping and an ice cream cone each thrown in. On Saturday I was at A for Art in Chesterfield where I had another lovely day. I was really well looked after and everyone who came along was so friendly that the day just flew by. I still have purple fingers after using Colourwash dyes which is my own fault for preferring not to wear any gloves and liking to handle ribbons that I've just sprayed with inks! 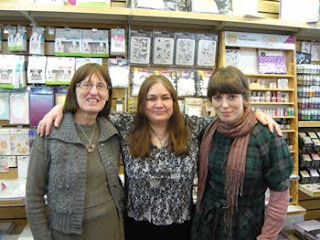 Here's me with the lovely A for Art ladies - I wasn't wiping my inky hands onto their shoulders...honestly! And this image proved to be one of the most popular of the day. It is a really evocative stamp from the Darkroom Door set called Wilderness 2. The scene puts me in mind of one of my favourite artists called Atkinson Grimshaw. I did several examples of how this stamp could be used to show how versatile it could be - will post some pictures of those next time. I used Colourwash dyes for this one, onto PI's infamous 300gsm card. I sprayed a mix of purple, blue and stream before spritzing with water and pressing a second piece of card on top to get two for the price of one! A little water brushed onto strategic areas gives the look of moon, stars and some light on the pathway. I used one of the new MS deep edge PATP sets (just the edger this time). This one is the double loop. The phrase is from the same stamp set. I'll be up in Lancaster at Card Craft (Millenium Heights) on Saturday, so if you'd like to see some of the techniques using Rangers spritzes and sprays I'll hope to see you there. On Sunday I'll be at Topaz to teach workshops - card making in the morning and a mini grungeboard album in the afternoon. Bound to be fun! Meanwhile, why not join in my sister's Heather's ATC swap? Hope the link works, as I didn't know how to do this until Heather told me! Fingers crossed! The theme for the swap is "in the pink" and is a fun combination of vintage men and the colour pink! All is explained on Heather's blog and, not only is there the fun of the swap, but the fascinating Cabinet card that she has made is up for grabs...it's gorgeous - well worth joining in for a chance to win it. Don't forget to email your quiz answers to me by this coming Saturday, as I'll be revealing the answers (hoorah, I hear some of you cry!) and the name of the brainbox winner on Sunday! You may or may not be pleased to know that I am already half way through setting the next one, though it will be a little different from the current one to give those of you who are being made ill by my cryptic clues a chance! Finally, my new stamps will be hitting the shops any day now, but I will keep you updated on that and let you know when they are officially "out there"! David, please find that new list of questions and hide it for good - my hair is just starting to re-grow!!! Love that blue card Lindsay. The saying so matches the gorgeous stamp. Wish I had gone to the Priory on Sunday now, did think about it too. Will try and see you soon.